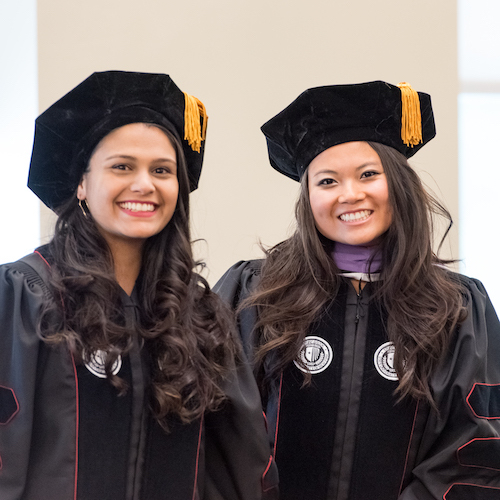 May 2018 - Stony Brook School of Dental Medicine's 2018 Commencement Ceremony was held on May 18th, 2018 and brought together students, faculty, staff, friends, and family to honor and celebrate the accomplishments of the doctor of dental surgery, graduate, and certificate candidates. Processional "Pomp and Circumstance" played as the platform party, candidates, Grand Marshal, Distinguished Faculty, and Faculty Marshals entered the auditorium. 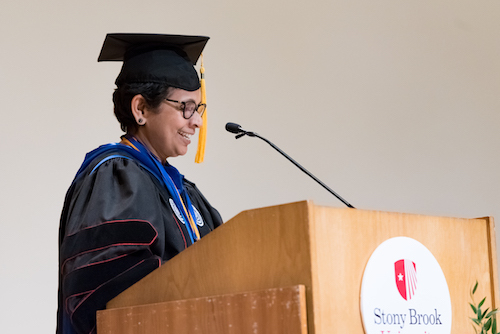 Mary Truhlar, DDS, MS, Dean, welcomed guests and introduced Latha Chandran, MD, MPH, Vice Dean, Academic and Faculty Affairs, Stony Brook University School of Medicine. Dr. Chandran served as the event's Distinguished Speaker. 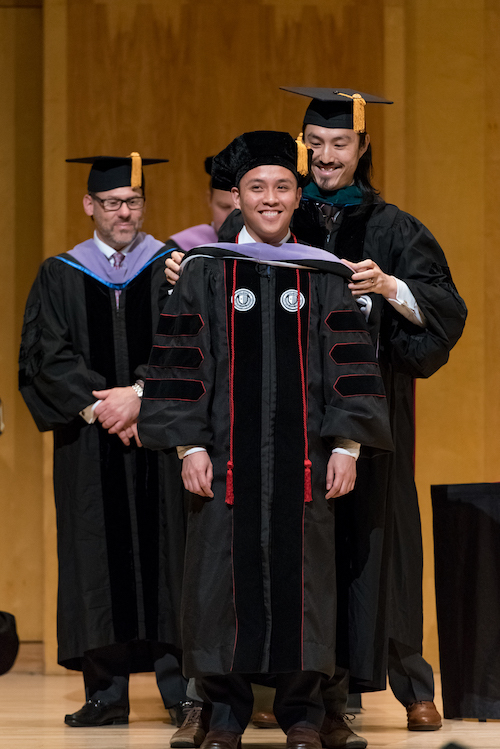 Charles Larsen, DMD, MS, Director, Advanced Education Program in Pediatric Dentistry served as Grand Marshal and highlighted the importance of teamwork and integrity before presenting the 43 doctoral candidates for the Hooding Ceremony. 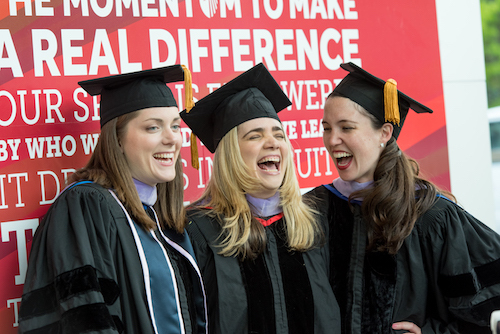 The Hooding Ceremony signifies academic achievement and is a key moment in becoming a doctor. 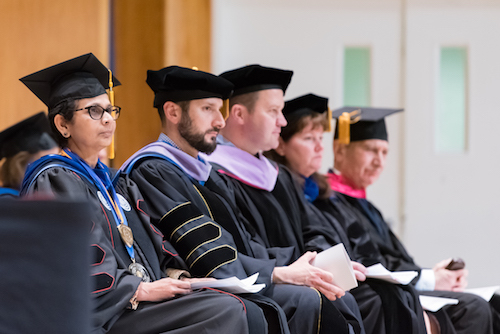 Following the Hooding Ceremony, Dolores Cannella, PhD, Associate Dean for Education, introduced the presentation of graduate degree and advanced education certificate candidates. The degrees and certificates were presented by the graduate and advanced dental education program directors to the 21 candidates. 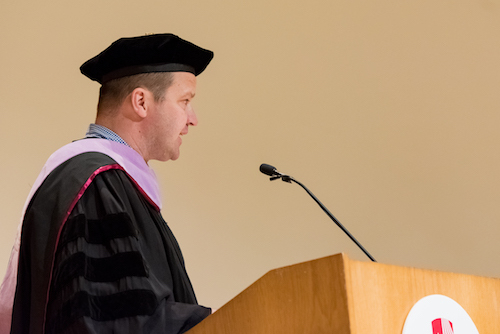 Sean Eccles, now DDS, represented the Class of 2018 as the Graduate Speaker and reminisced about the four years leading up to the moment of their graduation and walked through shared memories with classmates and faculty. Following Dr. Eccles' speech, Dr. Truhlar and all dentists recited the Hippocratic Oath ahead of the closing remarks. The ceremony concluded with the Stony Brook Alma Mater by Alina Tamborini and the recessional. 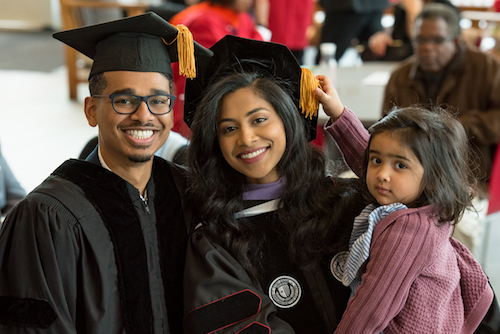 The graduates and their friends and families gathered in a reception as another memorable celebration after weeks of exciting events including the Senior Celebration Dinner and the Awards Ceremony. 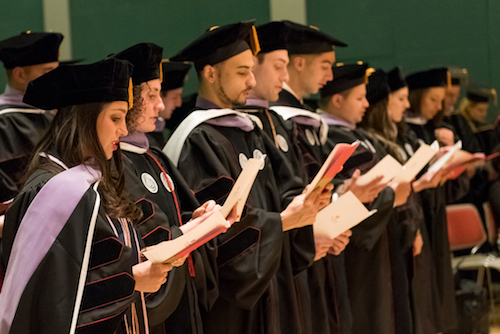 We congratulate the Class of 2018 and welcome them as part of our professional family and the ranks of our alumni! To view all photos, visit us on Facebook. To view the day's program and a list of all candidates, click here.